As most of you know I was on Fashion Bomb a couple of days ago and there were a lot of negative comments about my “hammer pants” jumpsuit. Overall the response was good and this is definitely not backlash, but I think I finally understand what some other bloggers issues with flattery are. About 90% of my garments I pick for style and flattery, but sometimes there are some things that I love, that I find stylish, and that I want to wear. I think today’s outfit was kind of rebellion towards flattery. I have wide hips, so to wear a dress that is going to make them look wider is a “no no” in many people’s opinion and really in my own opinion 90% of the time. But at the end of the day, I bought this dress because I thought it was fashion forward not because it was going to flatter me. As I advance in my own personal style, I am finding that sometimes style outweighs flattery. I also don’t want my body type or my size to dictate by personal style. I am very proud of the fact that with the strain of plus size clothing resources that I am still very much able to dictate how I want to look. I was so inspired by the collar area of this dress. A small detail that I really wanted to bring attention through keeping the attention of the of the eye from the neck up. 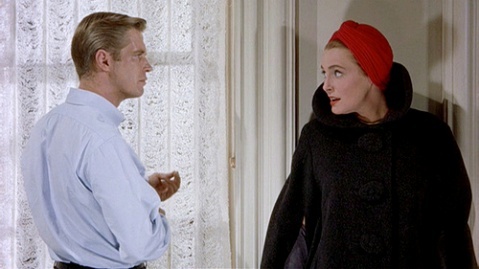 I didn't really mean to do it, but before I knew I had channeled my inner Emily or as most of us commonly know her as the "lady decorator friend" in Breakfast at Tiffany's. Though clearly out shined by Audrey Hepburn, I loved her style and she delivers the infamous line, I am a very stylish girl and she is! Forget those haters! You look fabulous! The dress fits you perfectly. I too have wide hips but I show them off. Why hide? Keep it up! I love this look! I actually think the dress is VERY flattering on you. First and foremost, sometimes you have to say F*$% flattering!! For some reason people think that a curvy/thicker woman can only be happy if she tries her hardest to resemble the body type of a straight sized woman. WRONG!! We don't always have to trick the eye to make us seem hourglass, or accentuate our hourglassness (it's a word for this comment purposes, lol). Sometimes, we just want to be FABULOUS!! You do that well Chastity. I read the comments over there. Congrats on the feature! Do you. I visit your blog regularly but rarely comment...IDK why! I love what you said about not allowing size to dictate YOUR fashion. Its the same for people in other areas of life, for example at one time a bright pink lipstick on a brown woman would have been considered unflattering...but now MAC features a Nicki Minaj collection, featuring neon pinks on a woman of color. Sometimes you re-define what's considered flattering by how you rock something and with your confidence! I actually commented on your feature on Fashion Bomb Daily. I really didn't think the pants were unflattering, I think a drapey fit works for larger hips and the color was amazing. To be honest I think it was more a bad pose then anything else. I applaud anyone who submits pics to that website! Some of those ladies are a little batty in my opinion, and I'm so glad your response was almost all positive! Well I love this comment. I have friends that won't wear bright lipstick b/c their lips are big. Like who cares, God gave them to you...work them. LOL...yeah I felt good about the comments for the most part...I think I just thought that a lot of the comments didn't give style and fashion consideration, just flattery. I LOVE this outfit, the hot pink dress and the blue turban, gorgeous combination! continue what youre doing, because youre great at it!!! This outfit screams style! You wore all of my face things in one look...turban,glasses,color,cape and leopard! I am so glad you bought those glasses....they are perfect! You have been killing it! Sometimes we project on our own insecurities upon others. I wish I was half as brave as you. Instead of conforming to the ideal, you dress to please yourself. I am 25 and still trying to find my personal style regardless of what others think. Your book helped. I love love love your emphasis on shapewear. It opened so many possibilities for me. Thanks for what you do. At 25 I didn't have half the balls I have now (yes I just said that)...LOL. But my comfort with myself starting right around 25 and just grew from there. I realized at 24/25, this is who I am and this is what I'm going to look like, I better work with it. Lovely! I don't think this dress is unflattering at all! It works for your body! Great color and shape! I saw you on fashion bomb and I didn't think most of those comments were "haters" many were honest. The Jibri jumpsuit would be flattering for your figure it's just that you paired it with that vest. I am an avid reader of your blog and I think a jacket would have been better for your shape. What in the world is so wrong with constructive criticism? Not saying this is just you, Chastity, but I do feel that when I read plus size fashion blogs there is a general feeling of "If you don't have anything nice to say, don't say anything at all." IMHO if we are going to put up blog photos they should be there for feedback, both pleasant and constructive. I love almost everything you wear! Regarding this outfit, however, I don't think the dress is well paired with black tights and a black belt in contrast with the blue turban. I personally think the black glasses are enough of a statement and could have done without the turban/belt/stockings. Am I hating? Absolutely not!!!! I love your style and this, as you said, seems to be a detour. I know as plus size women we have been targets for a long time, and continue to be. However, I do think we can be just a tad sensitive. I actually never called anyone a hater. I just said that I don't want my body type or size to restrict my fashion choices. You're right, you didn't, you called them negative. The first poster referred to them as " haters" and I amalgamated the terminology. I think that people forget that fashion is very subjective and changes over time. 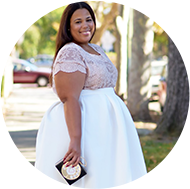 By posting outfits that don't necessarily fit "today's" idea of what is flattering, plus size bloggers are actually helping to move fashion forward. It used to be that fashion designers dictated what women were "supposed" to wear and I love that we're changing that! I think you look very chic in this dress and that's "flattering" to me. Ahh yeah...I love this comment -- This states my point so eloquently. Go you...you said it way better than I did. I think some people may have thought I was being sensitive to the comments and I wasn't I'm just always striving to be fashion forward. Love this look on you!!! And bump the haters, I like all your looks and they suit you just fine to me. That coat is to die for! I actually found your blog due to you being featured as a fashion bombshell. Personally, I love your style and can relate in so many ways. I do try to wear what flatters my body; however, if I see a style I wanna rock, I'm going to rock it regardless! I love this outfit, especially the dress and the turban. I noticed you got the turban from Asos. I have several turbans and I actually got mine from my local beauty supply store. They are much cheaper and good quality. Just thought I would throw that out there! Thanks for the tip & Welcome Welcome! I thought you looked marvelous! The people who have the worst to say read The Fashion Bomb to look like YOU! Kudos on an awesome spread! Don't pay attention to the others, if you want to wear that, let's use it! Most of the fashion blogs I follow are run by plus-size women. I love that they're so comfortable with their body, considering the society we live in that praises a thin body. I agree with the other commenters that you shouldn't let your size dictate your style. I absolutely love the coat and dress you're wearing in this post! The leopard print gloves are cute too! <3 it! <3 it! <3 it! That dress...that coat....those gloves...are everything!!!!! New to your blog and I think that you are uber adorable!!!! !